MusicTime Deluxe 4 - The Easy Way to Write, Play, and Print Music! MusicTime Deluxe is the easiest way to make music with your computer using your sound card or MIDI instrument. Whether you are a beginner, hobbyist, or professional, MusicTime Deluxe gives you the power to create and print music with lyrics, text and guitar chords on up to 16 staves. 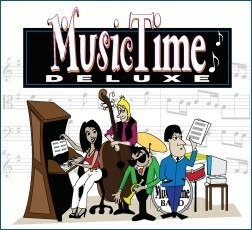 MusicTime Deluxe will allow anyone to write and arrange music for rock bands, piano and vocals, jazz combos, choirs, marching bands and other small ensembles. Discover for yourself how easy and enjoyable making music on your computer can be! Windows: PC (with Windows 10, Windows 8, Windows 7). Windows compatible sound card for music playback; Pentium class CPU or greater; at least 32MB System RAM; SVGA video. Macintosh: G3 CPU or better, 32MB of RAM, 16MB Hard Disk space, Mac OSX 10.3 or higher. Both require MIDI interface and MIDI keyboard (or other MIDI instrument) for live recording and a compatible ink-jet or laser-quality printer for printing sheet music. Upgrade / Update information: There is no need to have a prior version of Music Time installed on your computer, because on some operating systems this would not be possible. In order to qualify for upgrade pricing, please include the version number, platform (Windows or Mac), and serial number of your current product in Paypal's "Optional Instructions" field when you checkout. Distributor von GVox Notation Software in Österreich, Deutschland und der Schweiz.